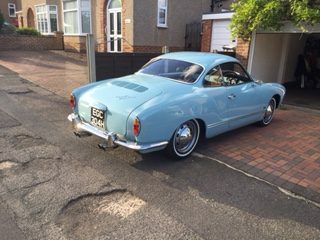 Yes, the Karman Ghia that graces the banner on the Jack Colby site is still alive and well. The car was owned for a few years by me, Jim Myers, back when this website/blog was first started. I sold it to a very nice chap from up North, Jason. Jason has had the car completely restored (down to bare metal) and very kindly sent me several pictures, one of which I’ve chosen to go with this text.